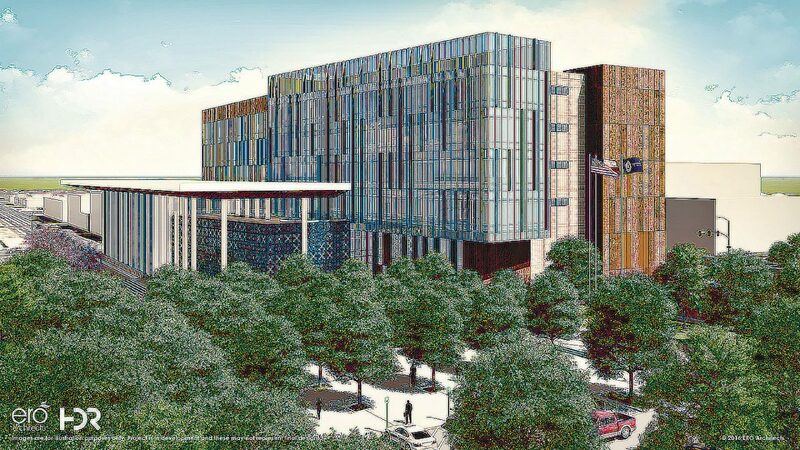 An artist's rendering of the proposed new Hidalgo County Courthouse. The county recently paid $1 million to complete the purchase of the land on which the current courthouse sits. EDINBURG — Hidalgo County agreed to pay $1 million to completely acquire the property where the courthouse currently sits. Steve Crain, the county’s legal counsel, called the transaction “a historic occasion for Hidalgo County” during a commissioners court meeting Dec. 19. The story begins in 1909, he said. The clause has been somewhat of an issue for the county for more than 100 years, he said. “We really don’t own (it),” he said. So the county reached out to the descendants of the original grantors and struck a deal to acquire the reverter clause for $1 million. Closing documents indicate the county purchased the clause from EIA Properties Ltd. Closing costs were just over $14,000. The move comes at a time when the county is preparing to build a new $150 million facility on the same courthouse square — though talk about moving the facility to another location is circulating. “If the courthouse would be moved to another location, then at that point all the property that’s on the courthouse square is no longer the county’s,” Hidalgo County Judge Ramon Garcia said. Crain indicated the clause — had it not been purchased — could have affected the construction of the new facility. “Any lender of funds to the county for the construction of the new courthouse might consider whether or not there could be an interest issue because if a reverter clause was still in existence it might affect the amount of interest or risk expense to the lender on that property,” he said. The transaction, which was handled by Edward’s Abstract and Title Company, was set to be finalized Dec. 21.